Do plants have intelligence? Do they have memory? Are they better problem solvers than people? 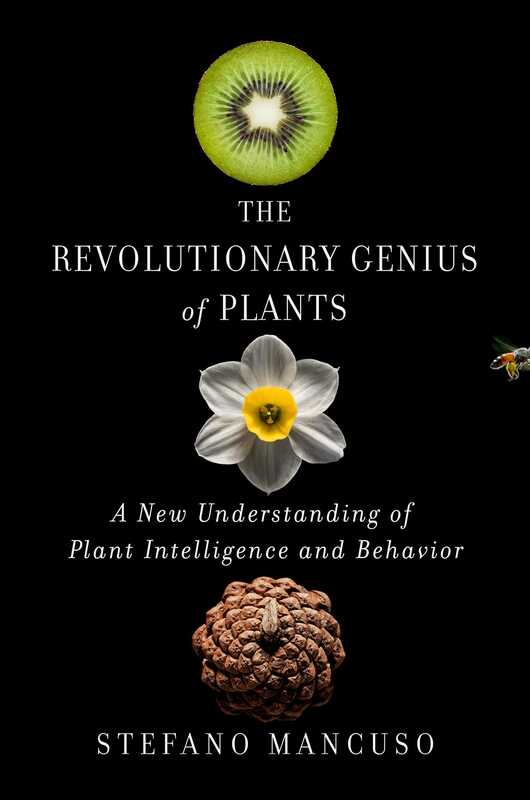 The Revolutionary Genius of Plants—a fascinating, paradigm-shifting work that upends everything you thought you knew about plants—makes a compelling scientific case that these and other astonishing ideas are all true. Every page of The Revolutionary Genius of Plants bubbles over with Stefano Mancuso’s infectious love for plants and for the eye-opening research that makes it more and more clear how remarkable our fellow inhabitants on this planet really are. In his hands, complicated science is wonderfully accessible, and he has loaded the book with gorgeous photographs that make for an unforgettable reading experience. The Revolutionary Genius of Plants opens the doors to a new understanding of life on earth. It is my impression that most people don’t really understand how important plants are for human existence. Of course, everyone knows—or at least I hope they do—that we are able to breathe because of the oxygen produced by plants and that the entire food chain, and thus the food that nourishes all animals on earth, relies on plants. But how many people realize that oil, coal, gas, and all the so-called nonrenewable energy resources are nothing more than another form of energy from the sun that was trapped by plants millions of years ago? Or that the active ingredients in many of our most important medicines come from plants? Or that wood, with all its amazing characteristics, is still the most widely used building material in much of the world? Our lives, as well as those of every other animal on this planet, depend upon the plant world. You might think that we would already have discovered everything there is to know about organisms that are so important to the survival of mankind and on which a large part of our economy depends, but we’re nowhere near that point. For example, in 2015 alone, 2,034 new plant species were discovered, and they were not microscopic plants that had somehow escaped the eyes of botanists. One of them, the Gilbertiodendron maximum, is a tree native to the Gabonese rain forest that is about 150 feet tall, with a trunk that can stretch to 5 feet in diameter, and that can weigh over 100 tons. And 2015 was not unusual; over the past decade, the number of new plant species discovered has exceeded 2,000 each year. Uses for more than 31,000 different species have been documented, including nearly 18,000 that have medicinal applications; 6,000 in our food supply; 11,000 in textile fibers and building materials; 1,300 for social purposes (including in religious rites and as recreational drugs); 1,600 as energy sources; 4,000 as food for animals; 8,000 for environmental purposes; and 2,500 as poisons. The sums soon add up: about a tenth of all plant species have an immediate use for humankind. Even if we recognize the central role plants play in our everyday lives—from the coffee in our cups to this book in your hands—the things that plants can teach us are less well understood. From materials to energy autonomy, from resistance capacity to adaptation strategies, from time immemorial plants have already provided the best solutions to most of the problems that afflict humanity. Between four hundred million and one billion years ago, unlike animals, which had to move around to find their food, plants took an evolutionarily opposite direction: they remained in place, getting all the energy necessary to survive from the sun and adapting their bodies to resist predation and outmaneuver the other innumerable constraints arising from being rooted to the ground. That was no easy task. Think how difficult it would be to stay alive in a hostile environment without the ability to move. Imagine you are a plant, surrounded by insects, herbivorous animals, and predators of all kinds, unable to escape from them. The only way to survive would be to become virtually indestructible. To counteract the problems associated with predation, plants have evolved in unique and unusual ways, developing solutions so different from those of animals that they have become the very epitome of diversity (indeed, plant species are so diverse that they might as well be aliens). Many of the survival solutions developed by plants are the exact opposite of those developed by the animal world. What is white for animals is black for plants and vice versa. Animals move, plants do not; animals are fast, plants are slow; animals consume, plants produce; animals make CO2, plants use CO2. But the most decisive contrast is also the least known: the difference between concentration and diffusion. Any function that in animals is concentrated in specialized organs is spread throughout the entire body of plants. This is a fundamental structural reason for why plants appear so different from us. Our approach to engineering and design has typically been to replace, expand, or improve existing human functions. Humans have always attempted to replicate the basics of animal organization in the construction of their instruments. Take the computer, for example. It is based on ancestral schemata: a processor, which represents the brain and has the function of governing the hardware, plus hard drives, RAM for speeding access to memory, video, and sound cards. Everything that man designs tends to have, in a more or less overt way, a similar structure: a central brain that governs the organs that perform its commands. Even our societies are based on this same centralized, hierarchic, and archaic design, a model whose only advantage is to provide quick responses—not always correct ones—but that is very fragile and, as we shall see, not innovative or always effective. Even though they have nothing akin to a central brain, plants exhibit unmistakable attributes of intelligence. They are able to perceive their surroundings with a greater sensitivity than animals do. They actively compete for the limited resources in the soil and atmosphere; they evaluate their circumstances with precision; they perform sophisticated cost-benefit analyses; and, finally, they define and then take appropriate adaptive actions in response to environmental stimuli. Plants embody a model that is much more durable and innovative than that of animals; they are the living representation of how stability and flexibility can be combined. Their modular, diffused construction is the epitome of modernity: a cooperative, shared structure without any command centers, able to flawlessly resist repeated catastrophic events without losing functionality and adapt very quickly to huge environmental changes. The complex anatomic organization and key features of plants require a well-developed sensory system that enables the organism to efficiently explore the environment and react promptly to potentially damaging events. In order to exploit environmental resources, plants make use of, among other things, a refined root system made up of apexes able to detect and monitor concurrently and continuously at least fifteen different chemical and physical parameters in the soil. It is no coincidence that the Internet, the very symbol of modernity, is built like a root system. When it comes to robustness and innovation, nothing can compete with plants. Their way of functioning is a useful model, especially in an age when the ability to perceive change and find innovative solutions has become a requirement for success. We would do well to bear this in mind when planning for our future as a species. Stefano Mancuso is one of the world’s leading authorities in the field of plant neurobiology, which explores signaling and communication at all levels of biological organization. He is the associate professor at the University of Florence in Italy and has published more than 250 scientific papers in international journals.